What to expect from #tnks? Now that I am a stakeholder in the publishing industry in India and over the next few years I hope to become a significant one, I am going to start talking about things I’ve learnt while I was working on #tnks (wow that was a long sentence). I plan to post my thoughts in a series of posts. And I am calling this series as Business of Books. So before I start getting into any serious discussion or prose, here are a few things that I would talk about over the next few weeks, months. If there is something specific that you want me to talk about, please do let me know. No, I am not an expert. I am a mere curious observer standing on the sidelines of this amazing business. Print vs Electronic. The non-stop battle between printed and ebooks. Which is better. Why? What is the alternative? The monies. What do the publishers make, what do authors make? Who else makes money. Of course a lot of guesstimating will be involved. Marketing. Of course. I am after-all a marketeer by training. The jury is still out on my “expert” level though. Managing egos. Of other writers, publishers, retailers, distributors. Even readers have egos! The mafia. No no, not the Italian Sicilian one. But the mafia in the books industry. Yes, there is. Trust me. I’ve had an encounter already. Thankfully it was not dirty. Support groups. I am lucky to have folks at Wrimo India as a huge support group. Without them, a lot of my work would have suffered. Why is important to have a group? What to do if you don’t have one. First-time authors. This one is probably where I’d spend a lot of time. After all, I am an outsider and it took considerable time, effort, hustle and luck to get the book done. Publishing for me was surprisingly easy. More on this as we go along. That’s all I can think of for the time being. I am hoping to do one post per week. Let’s see if I can stick to the schedule. No promises though. Oh, I just need to figure out how would onWriting.in co-exist with this. I don’t have answers for the time being. Let’s see when they dawn. In the meanwhile, hope you’ve ordered the book! The book has been getting rave reviews from people who've read it. Goodreads: Average of 4.29 (on a scale of 5) by 28 reviewers. Crystal says, "If you’re looking for an engaging, thrilling read which helps you escape tedious life and a plot that makes sense and leaves you with a thoughtful feeling, The Nidhi Kapoor Story is for you"
Kritika says, "…this is the most well-crafted story of the contemporary times. The mystery is huge, yet palatable, the thrill is unvarying and consistent, the plot line is well thought-out." More on the reviews page. Do let me know if you would want to review the book for me. Hi, I need help with a few things. Sales, spreading word and feedback. 1. Sales. Buy the book. And force all your friends to buy as well. And ask them to tell their other friends to buy. The book is available for purchase on Amazon and Flipkart. 2. Share / spread a word. Essentially this website and the FB page. The link is https://www.facebook.com/TheNidhiKapoorStory. 3. Feedback. If you've read the book, or know of someone who's read, please let me know what you thought of it. Please tell me how can I improve as a storyteller. After all, this is going to be the first book in a long list of many! My contact details are here. 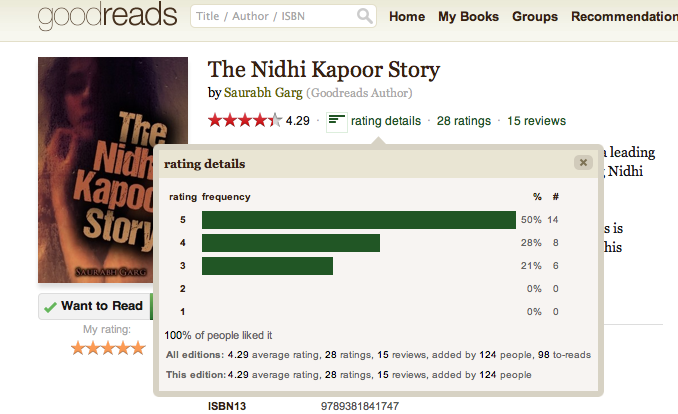 The Nidhi Kapoor Story for free? Nikhil on The Nidhi Kapoor Story for free? The Nidhi Kapoor Story for free? | The Nidhi Kapoor Story on Buy The Nidhi Kapoor Story!